Brad received his undergraduate degree from Ball State University as a national scholar athlete. He then attended Xavier University Master’s Program for Criminal Justice before receiving his Juris Doctorate from Salman P. Chase College of Law in 2002 while working as a Commonwealth Detective for the Prosecutor’s Office. He has been a life long resident of Ohio and Kentucky. As a prosecutor and in private practice, Brad has tried hundreds of civil and criminal cases while representing clients in the Court of Appeals up to the Ohio Supreme Court. 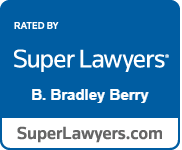 For the past 12 years, Brad has primarily focused his practice in family law, handling complex divorce matters, custody disputes and spousal/child support issues. Brad is an avid outdoorsman and wildlife adventure seeker. He enjoys biking, hiking, boating, swimming and camping with his two daughters. When he is not outside, you may find him supporting a fundraiser in a school cafeteria or volunteering for the Little Brother’s Friends of the Elderly, Cincinnati Chapter.